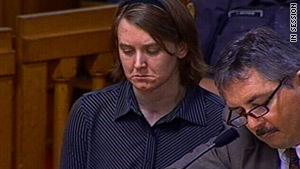 Michelle Kehoe has pleaded not guilty to charges related to the knife attacks on her sons. (CNN) -- A mother's plot to blame a stranger for killing her sons went awry when one of the boys survived and told police how Michelle Kehoe cut his throat, then moved on to his younger brother, an Iowa prosecutor said Thursday. Police found the 7-year-old covered in dried blood in the family van the morning of October 27, 2008, in a secluded area near a pond east of Littleton. Beside the van, his 2-year-old brother lay dead, his throat also slashed. "She cut me," the boy said in a high-pitched voice in an audio recording that was played Thursday in Kehoe's first-degree murder trial. Kehoe, of Coralville, Iowa, has pleaded not guilty to charges of first-degree murder, attempted murder and child endangerment causing serious injury. Before the trial, her lawyers filed a notice of intent to present an insanity defense, according to court records. Kehoe's lawyers chose to reserve their opening arguments for the start of their case. Dressed in a blue and white striped blouse, Kehoe frowned as she listened to her son's voice on the recording, occasionally bowing her head. The boy had locked himself in the van overnight after his mother slashed him and his younger brother the previous day and left them for dead, Assistant Iowa Attorney General Andrew Prosser said in his opening statement. Kehoe then walked to a nearby pond and attempted to kill herself by slashing her throat with the same weapon, a camouflage-handle Winchester hunting knife she bought the month before, Prosser said. When it became apparent she was not going to die, the prosecutor said, she staggered half a mile down the road to the nearest home and told a story she'd concocted weeks before of how a stranger abducted the family, killed her sons and tried to kill her. But when authorities went searching for the stranger, they instead found her 7-year-old son in the car and his younger brother dead outside the driver's side. "Do you know where you're injured at?" Deputy Stephen Peterson asked the boy in the recording. "Just my throat," the boy said. "Who did that to you?" The boy said his mother also put duct tape over his eyes, nose and mouth, but that he pulled them off after his mother left him. "She was hurting my baby brother," he said. Kehoe began plotting the attack the month before with the purchase of the knife and the duct tape, Prosser said. She allegedly chose the date of the incident to coincide with when her husband, Gene, was scheduled to take a yoga class, telling him they were going to visit her mother at a nursing home in Sumner. Police also say they found signs of a cover-up at the scene, including pieces of a first-aid kit scattered around the scene and a handwritten note documenting the attack, Prosser said. The note detailed how a man broke into the car when the family stopped at a gas station and forced them to the area where the van was found. Kehoe tried to fight him off with pepper spray but he knocked her unconscious, the note said, according to the prosecutor. Police said Kehoe later told them she had written the note in the midst of the attack to explain what had happened to those who would find the scene, according to the prosecutor. "And the note, which you'll see, ends with, 'Oh no, here he comes again...' " Prosser told the jury. Kehoe faces life in prison without parole if convicted of first-degree murder for her son's death.